There are some great posters – often displayed in school classrooms – showing words and phrases that we owe to Shakespeare. But recently, while getting myself into the mindset of writing my third novel, The Poppy Factory, I’ve discovered another source of vibrant vocabulary and phrases: the soldiers who fought in the trenches of the First World War. Did you know, for example, that if you’re feeling washed out, fed up, or downright lousy, World War One is to blame? Researchers Julian Walker and Peter Doyle analysed thousands of documents from the period including letters from the front, trench newspapers, diaries, books and official records to trace how language changed during the four years of the war. The published it in a great little book called Trench Talk: Words of the First World War, which has become a kind of bible for me lately! My favourite examples: communiques from headquarters were derisively known as ‘bumf’, short for ‘bum-fodder’, a term used for toilet paper. ‘Lousy’ of course comes from that scourge of trench soldiers, the common louse. ‘Cushy’ derives from the Hindi ‘khush’ meaning pleasure, and the phrase ‘blind spot’ came from the early pilots whose planes also had a tendency to ‘conk out’. 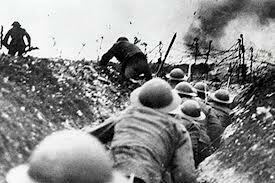 The brutality of life in the trenches gave rise to many euphemisms for death: such as ‘pushing up daisies’, ‘gone west’, ‘snuffed it’, and for fear, such as ‘got the wind up’ (referring to the way your stomach reacts to fear). The trenches were a melting pot far from the ordered class structure of Edwardian England, and after the war many colourful terms previously only used in one social class or one region entered into common usage. For example ‘scrounging’ and ‘binge’ came from Lancashire, as well as words previously only used by the criminal underworld, such as ‘chum’ (for an acccomplice), ‘rumbled’ (to be found out) and ‘knocked off’, or stolen. Sacked officers were said to have become ‘ungummed’ from the French ‘degommer’ (to dismiss). This quickly developed into the phrase ‘to come unstuck’, which we still use widely today. Finally, although we don’t hear it much these days, I was fascinated to discover that word ‘Blighty’ comes from the Hindi ‘bilati’ which simply means ‘foreign’. The term was used by Indian soldiers of their British colleagues, for whom it came to mean ‘British’ or ‘Britain’. More of the same please! Great post. Shipshape and Bristol Fashion. Means tidy, but why? Physical jerks. Means exercises (20th Century any way). It was interesting to see Blighty explained. Thanks for the post. No help with WW1 slang then. Thanks for clarifying.